The concept has become a production-ready model as Ford looks to fill the gap between the small Transit Connect and its grown-up, full-sized Transit sibling. It won't win any design awards. 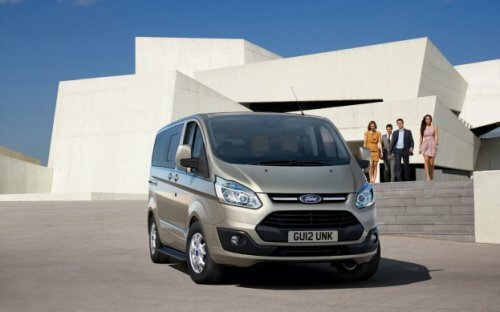 The Ford Tourneo Custom Van is now a production-ready commercial vehicle that's all about moving people. And that's it. It's definitely not going to win any design accolades, nor is it going to go down in history as a thing of beauty. The Tourneo, however, is meant for a specific European market that falls in between the needs covered by the diminutive Transit Connect and its large and in charge Transit sibling. Unlike its brethren, the Tourneo will not carry the Transit moniker, is dropping its former "Connect" title, and will not be sold outside of Europe. Despite being ugly, the Tourneo Van has a singular focus on one thing and it does that thing really well. It's a people mover and to do that, it's got three rows of comfortable, individual seats for a total seating capacity of nine. Yes, I said individual seats. Each row sports three individual seats that can be reclined, moved, and otherwise used independently. Granted, they are pretty close together, so this "individual" is akin to coach class on an airline, but it's much more accommodating than the average minivan's bench rows with limited room between. An 8-passenger configuration is available, removing the center seat in front, giving the driver and shotgun more room. Two wheelbase options are available, depending (literally) on how much luggage space you'll require. The shorter base (195.6 inches) has almost no space behind the rear seats for luggage or storage. The longer base (210.2 inches) gives all of that extra 15 inches of space to the cargo area. Also setting it apart from the other two commercial vans in its pedigree is the Tourneo's driving experience and cockpit. The steering controls and center console are straight out of a Fiesta. The van is being commercialized as a car-like vehicle, not a cargo mover, and is aimed at shuttle, taxi, and other business use that involves carting people around. So it aims to appeal mainly to car drivers, not professional drivers. This is also captured in its body styling, such as it is, which aims to look more like a car and less like an enclosed truck. Three engine options are also available for the Tourneo. All are 2.2-liter turbodiesels with outputs of 98, 123, and 152 horsepower. Whatever the engine, it connects to a 6-speed manual transmission in front wheel drive. The smallest engine is expected to return a 34mpg combined European efficiency. Little has changed from the Tourneo Custom Van Concept debuted in Geneva last month, as expected. The van will enter production shortly and begin hitting the European market later this year. Oh come on Aaron, it's not that bad :) It's not a pretty thing either but it's in line with European and US market tastes for that segment of the automobile. Considering the super job Ford has done on the Fusion, I'm sure the next generation will be better. I hope, at least.